This is called a Side Step Card. Amazing what we can do with a cut and some folds on a piece of card stock. The flowers were made with using position 3 on the Triple Layer Punch and rotating the pieces, then gluing them to hold into place. Thought this was a fun and bright card. Also, this is a reminder that today is the very last day to order from the Occasions Mini, don't miss out on products that you have been thinking about purchasing. ..... this DSP was used for the background and side accent piece. It was a 6" x 6" piece of paper that I cut down to fit the card front. I will have a tutorial on this card soon. It is very easy to make and could be done in any color combination. I used the Concord Crush for this card. We have replenished our supplies of Stampin' Scrub (item 102642) and Stampin' Scrub Refill Pads (item 101230) and are happy to announce these products are now available for regular orders. As a result of the material issues, our supplier was unable to provide the same scrubbing pad material. While you may notice a slight difference in the material, the functionality and high-quality standards remain the same. After in-house testing, we approved the material change because we found it to be an excellent alternative. 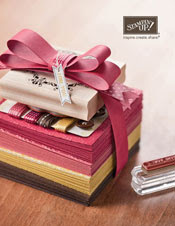 As you know, Stampin' Scrub was temporarily unavailable as part of the Starter Kit. Effective today at noon (MT), it will return as a Starter Kit item. Again, we thank you for your patience throughout this process. A couple of weeks ago I saw a card on Diana Gibbs blog that used a tea bag (created one) as an accent to a card. I thought it was a great idea and set out to create a couple of my own ideas. Here are the first two cards that I made. Tomorrow I will show you an additional card I made but this time I used Stampin' Up! paper punches to make the tea bag. 1. Score your card base (Marina Mist) at 4 ¼” and crisply fold with the bone folder. 2. Using Tangerine Tango Classic Ink stamp the fish body, fan tail, and 2 fins. I found that it was easier to stamp each image, then punch or hand cut out. The fins need to be hand cut if you use the same design I did above. 3. Using the Mat Pack and Paper Piercing Tool, poke a small hole in the fish body for the eye. Put your brad in this hole and secure by opening the prongs on the back. 4. Decide whether you want your design to be landscape of horizontal, then stamp on the blades of grass. This is a large stamp, so only part will fit on the card from top to bottom. You may need to stamp a 2nd time on the width to fill in the card. 5. Adhere your fish body, fan tail, and fins to your card. Score the Very Vanilla at 4 ¼”. Crisply fold with your bone folder. Build/layer tulip using demensionals on the top layer and SNAIL on the bottom layer. Place Old Olive flower stem on Marina Mist piece of card stock. Use Sticky Strip to attach ribbon to bottom of Marina Mist piece of Card Stock. Use Sticky Strip to attach Marina Mist piece to Early Espresso piece. Stamp sentiment on Daffodil Delight Card stock and punch out with word window punch. More My Digital Studio downloads are now available. New content posted every Tuesday. So many great items to choose from. Update from Stampin' Up! --- this product is now sold out. If there are products you are still thinking about ordering from the Occasions Mini Catalog, please order soon so you don't take the chance of the item being sold out too. Vanilla Rosettes Out of Stock --- From Stampin' Up! April 25, 2011 Due to high demand, our inventory of Vanilla Rosettes (item 118774) has been depleted and we are unable to order more. 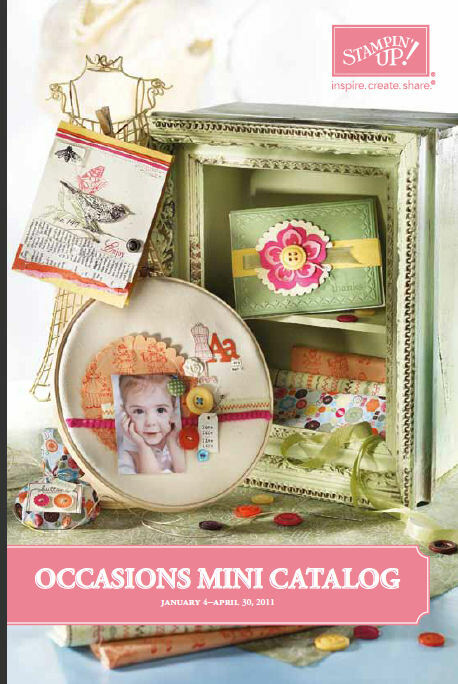 This product from the 2011 Occasions Mini Catalog is no longer available to order. Stampin' Up! Occasions Mini Catalog is only valid thru Friday. Just a reminder that there are only a few days left to order from the Stampin' Up! Occasions Mini Catalog. There is still time to order so you won't miss out. There will be two new tutorials posted later this week. Layer 1 is the first image on the card. Layer 2 is the third image on the card. Layer 3 is the middle image on the card. It's perfect for punching out in different colors and layering to have the other color show thru and match perfectly. I used our new Nautical Expression DSP as the backdrop. Item #122343. Both items will be available on May 1st. One of my favorite things in the new Stampin' Up! Mini Catalog (premieres May 1) are the two new Triple Layer Punches. I wanted to show you on this card that shows each of the layers. Layer 1 is the top flower. Layer two is the middle, and Layer three is the last one shown. If you punch out all 3 layers, you will have 5 separate pieces that can be mixed and layered so that colors show thru. On the first photo, the back drop to the card is our new Designer Series Paper - Nautical Expedition, item #122343. My husband absolutely LOVES LEGOs and we have many models displayed in our home. I was taking some photos of the London Bridge he built for our nephew and thought I would share them with you too. The model is 3 1/2 feet long. As stated in our announcement of the Grab Bag special offer, many of the grab bags contain precut card stock, ribbon, and other components from discontinued Simply Sent kits. Part of the value of these kits is the ability to quickly make multiple cards using the same components. While the original kits came with an insert that suggested a couple different projects you could make with the kit components, we were not able to provide that insert in the grab bags. Therefore, in order to assist you with ideas in how to use the Simply Sent components you may have received in your grab bags, we have included the instructional PDFs that came with the original Simply Sent kits in this current update. Please note that not every Simply Sent kit is represented by these PDFs; however, we hope that by having access to a portion of them, you will find inspiration for using some of the products contained in your grab bags. There are some really great ideas, that you could create using supplies you have at home too. If you are interested in purchasing a grab bag(s), go to my website then click on SHOP NOW the click on Grab Bag on the left side of the new window that has popped up. Available only as long as supplies last. While there, don't forget to check out the Clearance Rack too for more great deals on retired and discontinued Stampin' Up! products. April 21, 2011 If you own My Digital Studio, make sure your system requirements are up-to-date to ensure your software is running properly and you can take advantage of its full capacity. I am so excited to share with you one of my latest creations. I can't take credit for this idea, tho, I learned how to make the design from Tarheel Stamper's blog. The upper body of the dress is made with the Round Tab Paper Punch, item #119864. Then the dress skirt is made with the Blossom Petals Paper Punch, item #121808 using Card Stock Weight White Vellum, item #101856. I sponged the vellum with Stampin' Up! Classic Inks to change the color. (Be sure to let dry for a bit before putting together ... the ink stays wet longer than on regular card stock). Now that we have confirmed that the Blossom Petals Paper Punch is on the Stampin' Up! 's Occasions Mini Catalog Carryover List, this will be a class project next month!!!! Perfect card for the Princess in your life; for a ballet recital, or even a formal event that you would like to send a card. The color combinations are endless because you are sponging the color on. Colors used in the card are Blushing Bride and Concord Crush. I have a very special friend, Joan Hardy, who is also a very talented sewer. She is also part of my Stampin' Up! down-line KreatesKards team. Joan surprised me with this wonderful fabric basket that is just perfect for holding my Stampin' Up! Mini Catalogs to display during classes. The fabric is another item that is on the Stampin' Up! Occasions Mini Catalog Carryover List. Another reminder that the Occasions Mini Catalog (with the exception of the items on the Carryover List) will end on April 30th. The newest downloads can be found HERE for my Digital Studio. I was excited to see that Pocket Silhouettes Stamp Brush Set was in this new set of downloads. I love this stamp set and use it often. Makes great background papers. Also Stampin' Up! just posted the Carryover List from the Occasions Mini. These items will be available after the catalog ends on April 30th. Wait till you see the select items that will still be available like my absolute favorite Red Glimmer Paper!!!!! Oh my gosh, when I saw a sample of a Double Card on DOstamping with Dawn I knew I had to try this card. I tweaked the measurements as I wanted it to fit an A2 envelope. This definitely will be a class card in May. LOVE IT. It is actually two card bases adhered together on the back so that there are layers to open & display. The SNEAK PEEK item today is Summer Splash Stamp Set, item #123035- Wood OR item #123037 - Clear Mount. It has 7 designs ... all are shown above with the exception of a stamp that is air bubbles. We have friends going to Hawaii later in the year ... think this stamp set will be winner for cards for Hawaii, summer fun, the surfer in the family, and what a fun stamp set for kids' card too. Just a reminder that the Occasion Mini Catalog ends on April 30th. Don't miss out, place your orders soon. Also the Spring is Blossoming promotion ends then too. As many of you know, the Big Shot is one of my absolute favorite Stampin' Up! products. I love to receive a new catalog and see what new products we are going to be offering our customers. 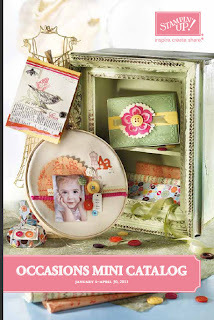 The Summer Mini Catalog did not disappoint me ... wait till you see the new Textured Impressions Embossing Folder. It is called Flower Garden, item #123113. Please note: When you receive your catalog the embossing folder shows the flowers on the left. They are actually on the right as shown in my photo above. Stampin' Up! has notified all demonstrators of this, so that we could let our customers know. I did a mix of Occasions Mini Catalog and Summer Mini Catalog products with my card. I used the Rosettes (Vanilla), item #118774 as an accent to the embossing folder. I sponged the embossed image and very vanilla card stock with Blushing Bride Classic Ink plus accented each rosette with a Basic Pearl (item #119247). Just a reminder that the Occasions Mini Catalog ends on April 30th. So you have less than 2 weeks to order from it. Don't miss out on the products you have been thinking about, place an order soon. For my customers, you should have your Stampin' Up! Summer Mini Catalog delivered to you within the next week or so. 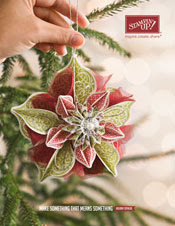 I purchase the catalogs, pay for shipping however Stampin' Up! mails them for me. Some of my customers received their catalog today, so I know they are in the mail to all of you. If you do not receive your copy by the 27th, let me know and I will put a new copy to you in the mail. If you do not have a Stampin' Up! Demonstrator, live in the US, and would like a copy of this catalog; I do have a few extra copies that I will be happy to mail. Drop me an e-mail with your name and mailing information. PLEASE, if you already are working with a Stampin' Up! Demonstrator contact them directly for a copy of this catalog. We do have to pay for them and for the postage. I do not mind the expense "if" you are interested in purchasing Stampin' Up! products thru me as your Stampin' Up! Demonstrator. We are only allowed to sell to individuals who resides in the US, so cannot mail catalogs outside of the US. We can order from the new Summer Mini Catalog as of 1 June. I will have an on-line link to the catalog on June 1st also. Wait till you see all the wonderful new products. Stay turned to my blog too for more Sneak Peeks this week. Another sneak peek today from the Stampin' Up! Summer Mini Catalog. You are going to love all the new items, and if you are like me, will have a hard time choosing which things to order first. The sneak peak item today is the Hello Blossoms stamp. It is a single stamp that is wood mounted. I used Stampin' Markers to color it in so that I could achieve different colors. Won't this be perfect for a card to remind someone you are thinking of them, to say hello, or write a short note. You all know how much I love our glimmer paper, so had to use a bit of it too before it goes away at the end of this month. Also wanted to use the Vanilla Rosettes as they are in the Occasions Mini too. Don't miss out ... order now if you want to be sure to have some on hand. It's not in the Summer Mini and no guarantee that these will be in the main catalog in July. The rosettes were dyed using Stampin' Markers. There is a blog entry on how to do this PLUS I have a video tutorial also. I accented the rosettes with our basic pearls and the leaves were punched out using the Two Step Owl Paper Punch. I'm combining a bit of old and a bit of new in this card today. Sneak Peek items are not available until 1 May. Current customers of mine will automatically receive the new Stampin' Up! Summer Mini Catalog by the end of the month. I have already purchased them and have paid Stampin' Up! to mail them directly to you. If you do not currently have a Stampin' Up! demonstrator and would like to receive the new Summer Mini Catalog, please send me an e-mail (link at the top of the blog) with your name and mailing address. DO NOT put personal information in the comment section here. Now back to the card. I wanted to use some of the beautiful fabric brads I have left in my stash from the Occasions Mini Catalog which ends on April 30, 2011. Then of course I wanted to share with you a couple of the new products from the Stampin' Up! Summer Mini Catalog. I'm so excited that we have 3 new paper punches coming out, two of which are Triple Layer Punches. Each punch will punch out 3 different designs that the outer outline is identical so they can be layered or use alone. I used Image #3 of the Blossom Bouquet Triple Layer Punch in the card above. I punched it out in 3 different colors to add to my card. I liked too that I could separate out the images/designs so that they formed two completely different looks. Did you notice the Baker's Twine that I wove thru the blossoms. It is a new product for Stampin' Up! too and will come in 3 colors (early espresso/white or cherry cobbler/white or white). Don't miss out on the items you want from the Occasions Mini Catalog. There are just 2 weeks left to order from it. First I want to thank Betty H. for making this beautiful birthday card for me. It is amazing, and just knew my blog followers would love to see it too. My birthday was on Tuesday and I received so many wonderful cards, birthday wishes, phone calls, and visits. It made my day so special. Hal had the day off, so we went to the zoo, out to lunch, then shopping, then out to dinner. In the evening our good friends stopped by. Their daughter, Kassidy, is 4 and such a doll. She gave me a dime from her money she had, because she wanted me to have it for my birthday. I told her that I would put it in our coin bank as we are saving up for vacation later this year. She was so pleased. Her generosity touched my heart. I couldn't of asked for a better gift. Adhere the Paisley Petals DSP to the card base front. Punch out 4 Cherry Cobbler Decorative Label Punches and 2 Marina Mist Decorative Label Punches, assemble as shown on next page. Using the Boho Blossoms punch and the Daffodil Delight Card Stock, punch out 2 sets of Boho Blossoms for your card. Attach to the two shadowed decorative labels that you just made. i. Using Paper Piercing Tool and Mat Pack, poke a hole into the center. ii. Push Flower brad into the hole and open prongs to secure. iii. Attach shadowed Decorative Labels to the card front with dimensionals. Stamp greeting inside of card if you would like. The latest My Digital Studio Downloads were added today. Be sure to check them out. Lovely As a Tree Brush Set is one of them!!!! I'm taking a break today from blogging and will be spending the day celebrating my birthday. 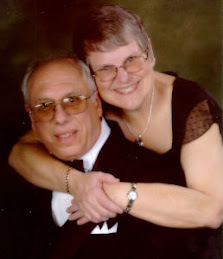 I feel very blessed to have such a wonderful husband, family, and dear friends. Stop back tomorrow for a new tutorial. 1. Score the piece of Old Olive Card Stock (5 ½ x 8 ½) at 4 ¼. Crisply fold with the bone folder. a. Center the punch on each side of the square and press. b. Stamp Grasshopper on center piece. d. Feed striped ribbon thru the square, then attach to the Early Espresso Card Stock with Scotch Tape or Sticky Strip or Adhesive. i. Attach this to your card base. ii. Using mini glue dots attach your buttons on the 4 corners. 3. Stamp “bugs and kisses!” with Old Olive Classic Ink on Very Vanilla Card Stock. a. Punch out with Decorative Label punch. c. Place 2 dimensionals on the back and place on card. c. Glue to Decorative Label (Early Espresso) and then to inside of the card.